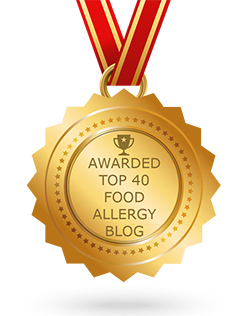 This food allergy review was provided by Laurie, who is sensitive to gluten and soy. The red tiled roof on the stone siding on the tower looks more like a high end Southern California home than an Italian restaurant. I drove my mobility scooter through the double doors thanks to an employee opening the door. After being warmly greeted by the staff I took in the lobby’s decor. Along the wall are cases with various platters and other service pieces. I was quickly seated in the main dining area. I like that the lights are dim but still bright enough to read the menu and see the Italian theme. Finally I see an Italian theme of brick arches, electric candle wall sconces, bric brac, and wooden partitions that divide the restaurant into more private seating areas with tablecloth covered tables that have paper covering. Guests who want privacy should tell their seater that they need privacy before being seated. I was told that the chef would be out shortly so I headed to the beautiful bathroom with hot and cold water faucets. It is nice to see marble and hot water in a bathroom. I came back to find Orlando the chef waiting for me. He walked me through the menu and around my restrictions of no wheat/gluten and no soy. I was not going to do the Tuscan bean soup because I am not a fan of bean soup. The waitress brought out an orange bowl of soup with a small slice of cheese. This is one of the best soups I have ever. There were good pungent notes of herbs and tomatoes, tiny bits of ground meat, ground beans, white cheese to sooth the mildly spicy burn of the soup, onion bits, and carrot bits. The dish can be made free of most top allergies. I like best that the beans were smashed to bits thus not overpowering this hearty homestyle soup. Next came a cart with a big white porcelain charger with a cute little cast iron pan. The waitress set the pan on fire then she squeezed lemon juice on the pan then served me the Shrimp Sambuca. In the pan was tender small potato wheels topped garlic and 4 perfectly cooked shrimp. The dish was baked in a wood oven. I loved the potatoes that tasted like home fries and that the shrimp were veined with tails on. Another perfect dish suggested by the chef. Finally comes the star dishes. 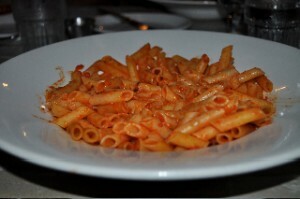 I chose the Penne Bolognose in an orange tomato basil sauce using rice penne pasta. The bowl was huge and filled with rice pasta cooked perfectly then topped with Bolognose sauce and fresh parmesan cheese. This is a huge bowl of pasta. It is hard to make a large serving of rice pasta perfectly but this is something I would go back again to eat. The sauce is similar to Mario Batali type of sauce with a bright orange hue that for some folks may seem strange. The meatballs were a good size but did not have onion bits and it seems that even the little bits of meat was just that, meat. It is a hearty dish that is very mild in spices and nuance. I like to take home food for breakfast the next day so I ordered the duck leg This is not presented as duck confit but more of a roast that is braised apple cider and dried cherries for over 3 hours. The slow cooking imparts subtle flavors to the duck leg that actually is the thigh and leg not just a drumstick. It reminds me of the carnitas and carne asada that are slow roasted. The meat left me wanting a few more orders. Being a whole thigh and leg meant some skin and fat that I did not eat. I took this home for midnight snack. The duck was so flavorful yet I could not name one note other than cherry sauce and duck, it was a medley of herbs and spices that made for a harmonic entree, OMG this was AWESOME!! The polenta is good but it is not as fine grained as at The Wave. There are kernels of corn that added a nice change in the mouth feel that one gets from nonstop polenta. The one major flaw was that the polenta was sitting under grease dripping duck leg and a pool of cherry whatever sauce. Some people love potatoes or polenta under their meat to sop up the meat juices but the pool of sauce was soaking into the polenta. I think if I ordered this again I would order the polenta on the side. The grand finale was a Panna Cotta that hit me with pure cream smoothness and a POW of vanilla, the berries and sauce are delicious alone but here they are kazoo players playing in the philharmonic. The service was spotless and the table was kept free of dirty dishes while the tea glass was kept filled. They brought out the bill and took my Tables in Wonderland card. 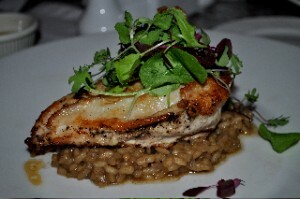 I loved Orlando and the staff that made this one of my more memorable meals. Orlando and the Portobello staff can handle most dietary requests. There is an outdoor dining area and staff will try hard to meet special requests such as a semi-private area for an autistic guest or a table for a guest in a wheelchair. There is an outdoor patio for watching the DTD waterfront comings and goings. 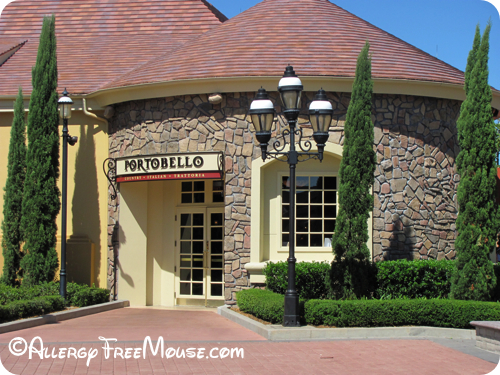 If you would like to review Portobello or any Disney restaurant, submit a food allergy dining Quick Review. When one of our Twitter friends, Candice (@Candicerose90), asked us for our favorite Disney Boardwalk restaurant, we had to confess we had never been there. Then, we asked her to share her experience here, and she graciously accepted! When I first went gluten-free, we had an upcoming trip to Disney planned. I had slowly started to see how the diet had a positive impact on my health, and was concerned with how I was going to maintain the diet away from home. With a little research and hearing from others experiences, I was ensured I would be in good hands. After having a wonderful experience two years ago my family and I recently returned to Orlando knowing that I would be able to enjoy great, safe meals throughout the week (since dining at Disney the first time I am now also dairy-free). Though we came to relax at a resort, and did not specifically go to any Disney parks we dined at many restaurants on Disney’s Boardwalk, Downtown Disney Area, as well as the Grand Floridian Hotel. Below is a breakdown of my experience. Paradiso 37, is a hip, but casual South, Central, and North American inspired cuisine restaurant located at Downtown Disney’s Paradise Island. They offered many GF items, and many things could be made without cheese. Items that were fried were off limits because of cross contamination, however instead of frying the items you can request it be grilled. 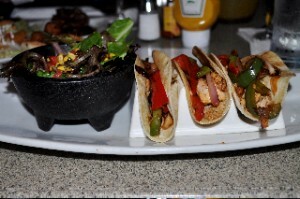 I order chicken tacos, with onions and peppers in a corn tortilla. On the side, I got a salad. 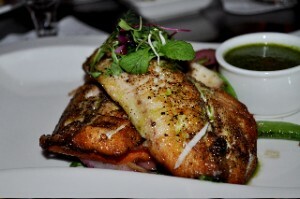 The meal was flavorful and very yummy. 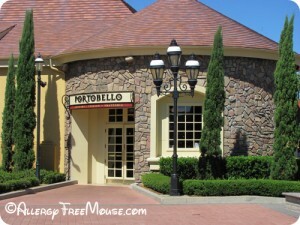 The next night we dined at Portobello (also at Downtown Disney) restaurant. For dinner I got the “value meal”. It came with a house salad, a giant dish of GF pasta (I chose tomato basil sauce) and a dessert. Though I opted not to have dessert (I allowed my brother to have mine), the GF/ DF dessert option was mixed berries. Note: They do recommend that you make your reservation in advance to guarantee that they will have GF pasta on hand. It is too hard for me to decide what my favorite meal was when dining at Disney. However, it would have to be between the Tilapia dish I had at the Flying Fish Café (Disney’s Boardwalk), and the Roasted Chicken Dish I had at the Grand Floridian Café. Not only did I love the atmosphere of the Flying Fish Cafe, but I loved before my meal I was able to enjoy a warm gluten-free roll! This was something I had not been able to enjoy at any of the other restaurants, so it was a really nice treat. One of the places I was most excited to visit on our trip was Babycakes NYC! Their newest location is now open in Downtown Disney! I have been to the NYC location, and own both of their cookbooks. Needless to say I think their gluten-free treats are amazing! In addition to being gluten-free Babycakes is casein, wheat, soy, and refined sugar free, and is a kosher and vegan bakery. 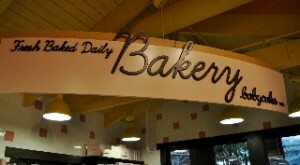 The bakery is a great new addition to Disney, and adds to the “magical experience” for us with food intolerances and allergies. To say that I had a wonderful dining experience at all of the restaurants is an understatement. The experience that I had at Disney is one that can bring tears to my eyes. It was so nice knowing that each time I dined at Disney; I would be able to enjoy a safe meal without the worry. Make your reservation in advance! Though many restaurants will accommodate you the day of, booking your reservation will eliminate stress and guarantee they will have the items on hand in order to make you a safe meal. Many Reservations can be made online (some have to be done over the phone). Remember to click the food allergy notification option. 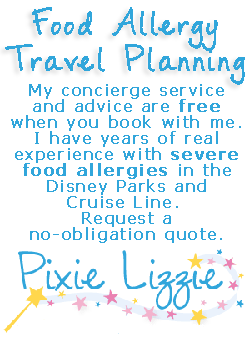 Before heading off to Disney, contact a representative regarding your dietary needs. (SpecialDiets@DisneyWorld.com). They will send additional instructions as to how to request special meals, and will also provide you with a list of safe food items that you can find throughout the parks! Candice has a fantastic gluten-free living blog called Embrace G-Free. Be sure to read more about her Disney trip there. You can also find her on Twitter at @Candicerose90 and on Facebook.